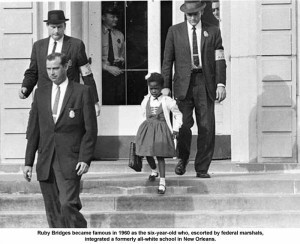 The painting, as you can read in the little history that is given, portrays a real event: Ruby Bridges, an African-American student being escorted to an all-white school. Analyze the photograph and then what is going on in the painting. Notice that while the photographer reports on the actual event, the painter comments about it. What might the artist of the painting be saying that the photographer isn’t? Now compare the two pictures to what is portrayed in TKAM. How are they similar in plot, character, setting, and theme? Write a few paragraphs that compare the literature to the images. Use the book and cite quotes when needed.